This event finished on 06 April 2018. 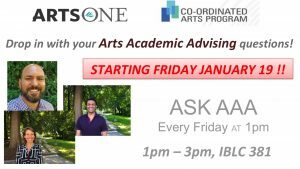 Your fabulous UBC Arts Academic Advisors (Adam, Atul, and Leah) will be here for drop-in advising each week in your Gateway Study Suite. They’re ready and waiting to answer your questions, big and small.